Dave Concepcion has a special place in my memory because when I was a kid he once appeared on the cover of Boy’s Life, which my brother had a subscription to as part of his membership in the Cub Scouts. This was for me something like finding some Spiderman comic books or a plate of fudge in the socket aisle at a hardware store. The usual contents in Boy’s Life—fixing stuff, building stuff, lighting fires with no matches, performing resourceful courageous rescues, communing healthily with other young capable outdoorsy boys, cataloguing in a manly scientific way the splendor of nature, helping others, etc.—never interested me, so I was pleased to have something in that corner of my brother’s life that I could relate to. I don’t actually know how much my brother enjoyed the Cub Scouts, and in fact I’m pretty sure he bailed out prematurely, right around puberty, after he’d earned a couple but not all of the hierarchical series of patches. But into adulthood he has retained a level of comfort with the tasks of the outdoorsman that far surpasses my own. He knows how to set up a tent and identify a bird and start a fire, to name but a few of the things that I approach clumsily and stagger from frustrated, my glasses askew. For him the wild is a place to go to shrink the tasks of a difficult everyday world to a manageable level while simultaneously widening a sense of that everyday world beyond the confines of the necessary economic trenches most of us dive down into most of our days. I like going into the woods for the same reasons, but the work that needs to be done there always gives me back a familiar sense of myself as a generally incompetent guy. Given this, it occurs to me to wonder where I go, if not the woods, to give myself a sense of competence. The answer is the same now as it would have been thirty years ago, when I was the kid who got excited to see Dave Concepcion on the cover of Boy’s Life. I liked at that time to get away from the world by going into baseball universes inside my head, and the same is true today. What I’m driving at here is that while I may not know how to fix a flat or gut a fish or understand what an IRA is or ballroom dance or tell a joke or build a table, I am, by god, a pretty good leader of imaginary baseball teams in the online Strat-o-matic baseball leagues with player pools based in—where else?—the 1970s and 1980s. I am no Panzer Ace, mind you. (In case you were wondering, Panzer Ace is the unfortunate moniker of the guy who wins just about every league he enters. If inflection of voice were possible in such areas, he would be spoken of on message boards in hushed tones.) But my teams manage to get into the playoffs more often than not. So what’s my secret, you ask? (I am sure this is the first question that comes to your mind, and not, for example, “Doesn’t it ever occur to you that one day you’ll be on your deathbed wondering why you spent so many hours worrying about imaginary batting orders?”) I’m glad you asked. In two words: Dave Concepcion. Well, not just Dave Concepcion. But in my experience building a team around a great-fielding shortstop and a great-fielding second baseman, especially if either or preferably both of them can also contribute to the offense, is the best way to ensure that your team will be competitive. Centering your team’s defense, they make mediocre pitchers good and good pitchers great by gobbling up everything hit to them. And if they can hit, as Dave Concepcion could (or, in my imaginary worlds, still can), they make it much easier to build a lineup without any holes, other spots on the diamond being much more easy to fill cheaply with effective offensive players. I realize that there is nothing more boring than hearing about someone else’s imaginary sports team, so I understand that I may have killed off most readers willing to start off on the trek of this essay by now. But initially my main goal today, believe it or not, was to give my voice a rest and open up a discussion. It’s just taken me a long time to get to the point I intended to make early on: that according to one of my lone areas of expertise, on-line imaginary baseball, the surest way to build a good team is to start with excellence at shortstop and second base. With peak performance and long-term effectiveness having equal importance, which two players made up the best second base and shortstop combination in baseball history? Also, FYI: There’s an interview with me about baseball cards on ephemera today. The fascinating site, which focuses on various types of collecting, is definitely worth a look. 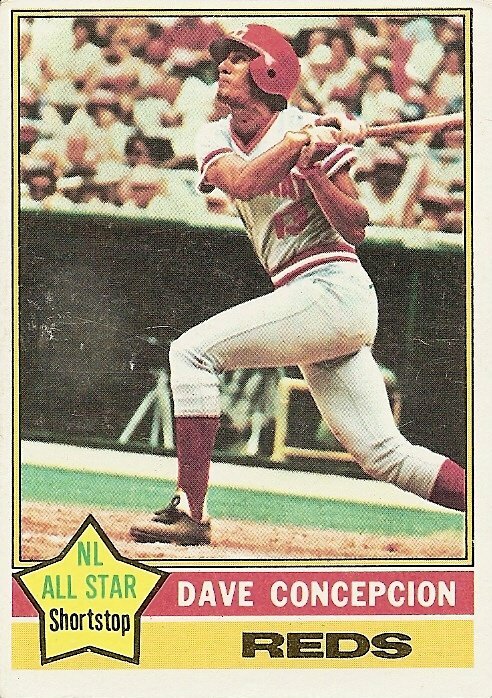 You are currently browsing the archives for the Dave Concepcion category.